In a world that has seemingly run out of creative ideas, why not bring back MacGyver? The problem is that the original is so iconic, it would be like bringing back Columbo. Or Quincy. Or, God forbid, Magnum. For several years, and seven seasons, Richard Dean Anderson ruled TV as the guy who could make a bomb out of chewing gum and found the paper clip to be the most important tool in his arsenal. Who could top that? Unfortunately, not Lucas Till, a.k.a. nü-MacGyver. He certainly tries hard, but he’s about a decade younger than Anderson was when his MacGyver debuted, and the shift is jarring. Anderson’s MacGyver was certainly someone you would follow through an acid-drenched tunnel after a building exploded (the trek from the original pilot). Till looks like someone who might be able to hook you up with some out-of-state fake IDs. He gamely inherits all his predecessor’s mannerisms (hokey voice-over, fear of heights, unwillingness to use guns) as he disarms bombs with dental floss and manufactures makeshift parasails. But he lacks the gravity necessary to make this character more believable, that he would be someone who could conjure up a random historical name from 1906 without even so much as a Google search. That voice-over is also vital to the series, but it’s a bit problematic here. This MacGyver can’t decide whether he’s light-hearted or dark-hearted, a James Bond wannabe or a rugged adventurer. In the pilot, MacGyver gets shot, and follows with, “I know what you’re thinking…” which is too faint a colloquialism for a seemingly tragic event. If he flopped down from his parasail into a pig sty, maybe. His initial caper involves a lot of his impressive magical trickery (creating an electromagnet! Or a smoke bomb with aluminum foil! ), alongside some classic MacGyver hand-to-gun combat. But then a foot chase ensues, and the perspective shifts to… shaky hand-held camera? Almost as shaky are the shifts in tones from the pilot, from jokey wisecracks between MacGyver and his team to a tragic loss to the possible mass murder of millions to about the corniest ending imaginable (see below). The camera (steered in the pilot by The Conjuring director James Wan) is not the only thing making the viewer queasy. Sure, the stunts are impressive, showing how to stop a plane with your bare hands (helpful screen caps identify “hydraulics” versus “electronics”) or that frickin’ parasail. MacGyver’s crew has expanded to include a lost love, a best friend/roommate who has no idea who he really is, a stern boss lady, and a requisite edgy hacker type. Shaving a few decades off of MacGyver’s backup is George Eads as Jack, in Dana Elcar’s old Pete Thornton role. Where Hill is a bit slight and unsubstantive, the show may have been better off putting Eads in the lead. At least he has a sense of humor about the whole thing; his delivery of “my man never jokes about tin foil” is exemplary. An early trailer shows that Eads and Till are the only holdovers from the original cast; Till had much longer hair, possibly in a nod to the original MacGvyer mullet, and was a member of a strategic task force instead of the shadowy government agency where MacGyver now resides. Still, an almost complete pilot overhaul (even Eads’ character’s name used to be “Lincoln”) is not a great sign. 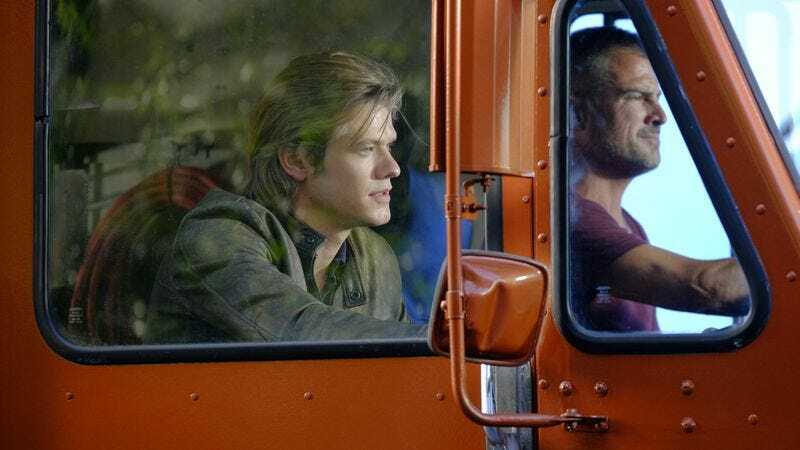 The problem with a MacGyver reboot is that, three decades after the show’s original premiere, CBS must have reasoned that the new version would have to be bigger and flashier. This reboot accomplishes that, but in doing so, loses the whole point of MacGyver in the first place. MacGyver was always about making more out of less, picking up whatever he found in his knapsack or on the goddamn ground to make his latest adventure assignment work. In 2016, it’s hard to make a paper clip flashy, even with CGI. Still, the show might have had a chance, but unlike Anderson, this lead just isn’t strong enough to carry us through. It’s like casting a new Columbo with a Jonas brother. There’s one horrible trope the new MacGyver keeps intact, however. At the end of the pilot, MacGyver and his pals are sitting around a backyard fire and do that bit where they all just start laughing for no reason. Of all the things to drag back from the TV world of the ’80s, MacGyver picked one of the worst.